This unique Zondervan Bible Extract is one of three courses taking you quickly into passages every Christian should know. In this bite size edition you'll spend two weeks in the Old Testament studying passages from Genesis, Exodus, 1 & 2 Samuel, 1 Kings, Job, Psalms, Isaiah, Daniel, and Amos. Each daily reading should take only about 10 minutes. There are 14 chapters of scripture included. You'll… also find question-based notes that clarify the meaning of the Bible text. "e;Would God ever ask us to do wrong? "e;"e;Who is God, what does He value, and how can we approach Him? "e;"e;How can God be both a powerful ruler and a gentle shepherd? 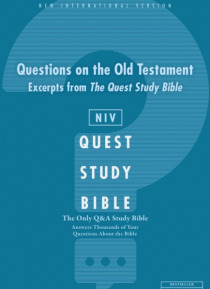 "e;While it does not contain the full Bible it does contain all the verses associated with the Q&A on the Old Testament reading plan.